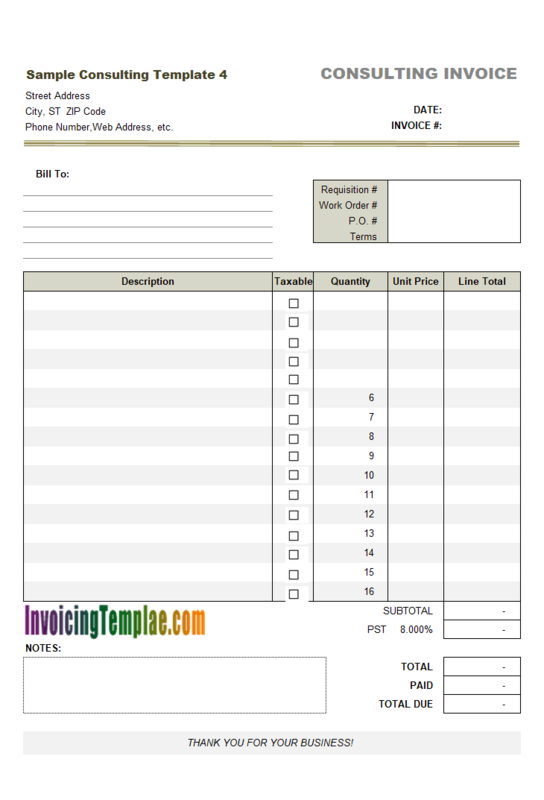 Consulting Invoice Template is suitable for those who provide consulting service. 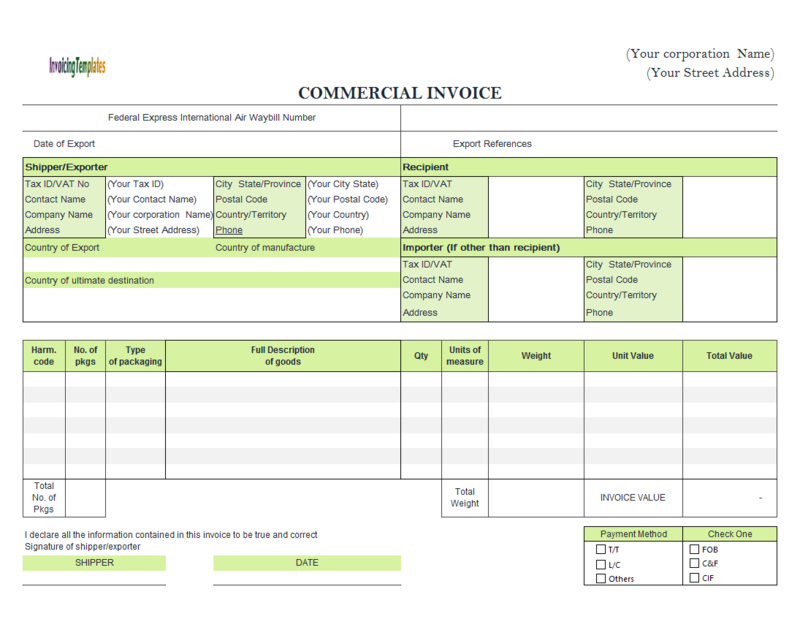 It details invoice #, invoice date, client information, service provided. 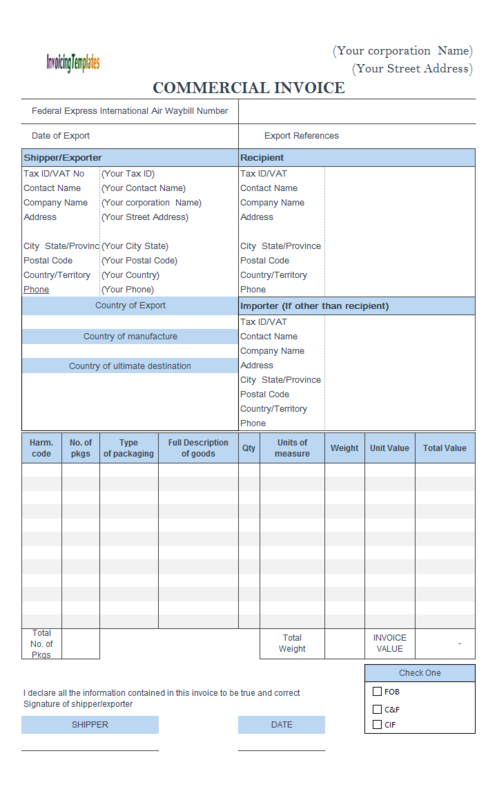 Two tax types are supported but customization is possible. 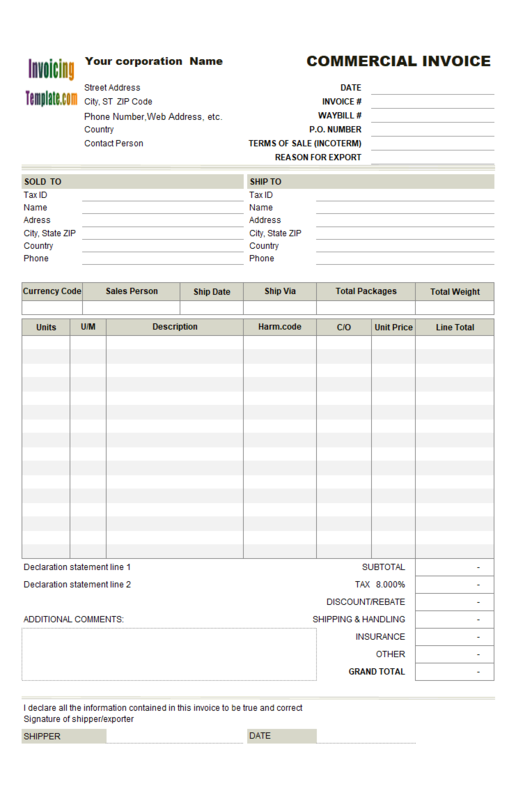 c4008 now includes the customized invoice template for the latest version of Invoice Manager for Excel. 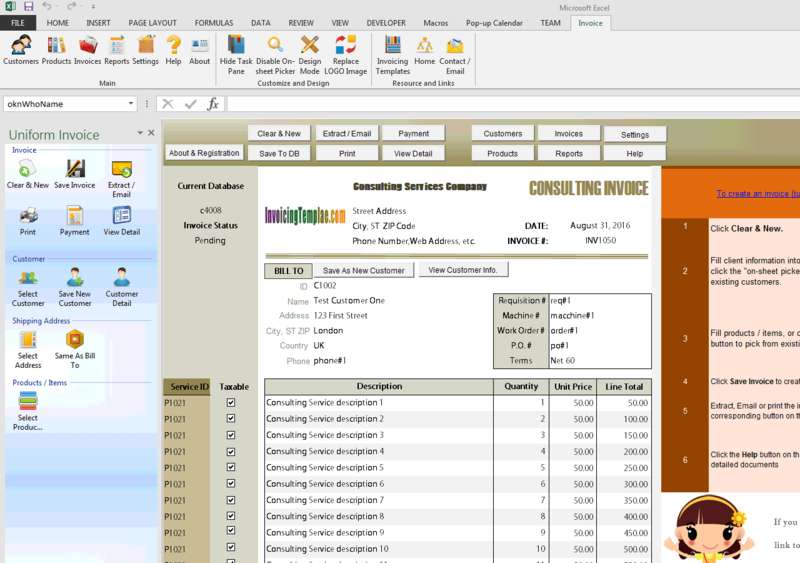 This is what you will see when you open consulting-template.xlsx. 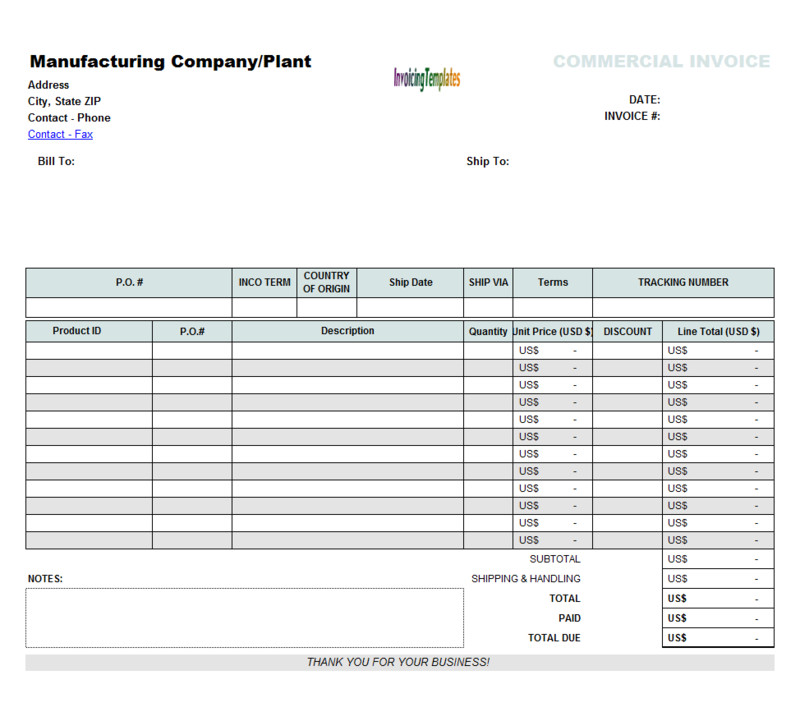 If you running a consulting business, this simple consulting invoice could be used as a sample or starting point of your own invoices. Being a consultant your most important work includes setting consulting fee rates and making money, but providing a professional and beautiful consulting invoices could help you collect payments easily and quickly. The template is in Microsoft Excel spreadsheet format. 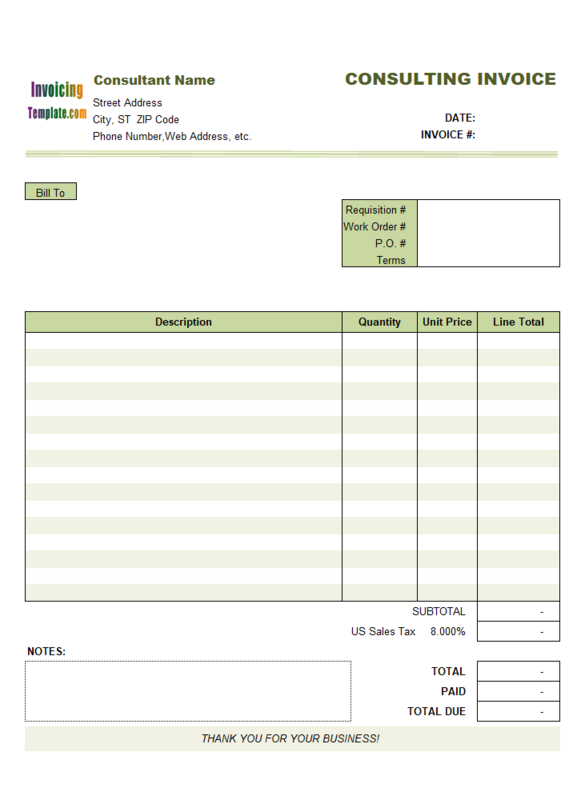 Compared to a Word document, it is much easier to do calculations using Excel. 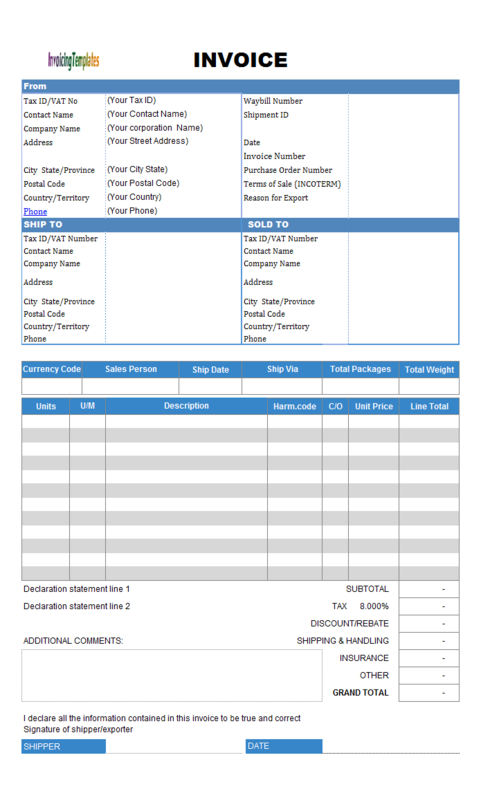 It is a simple template, with only a limited feature set that cannot be compared with a fully featured accounting system or invoicing program, such as Invoice Manager for Excel (namely Uniform Invoice Software). 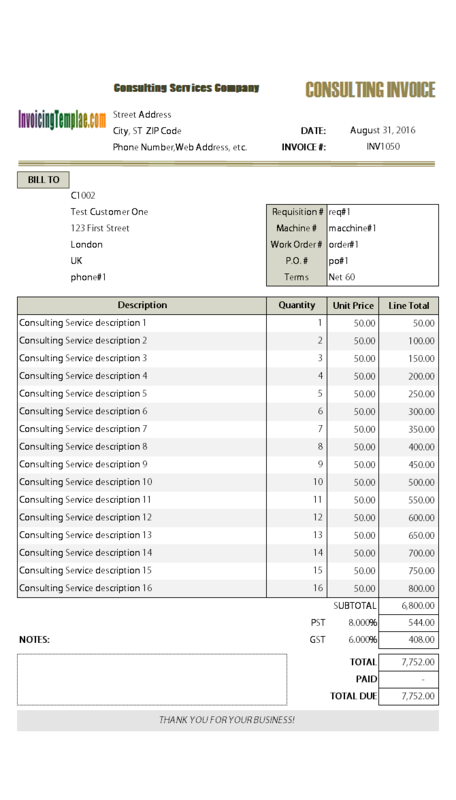 However, the invoices produced by the consulting form are just as good as many professional billing software programs. 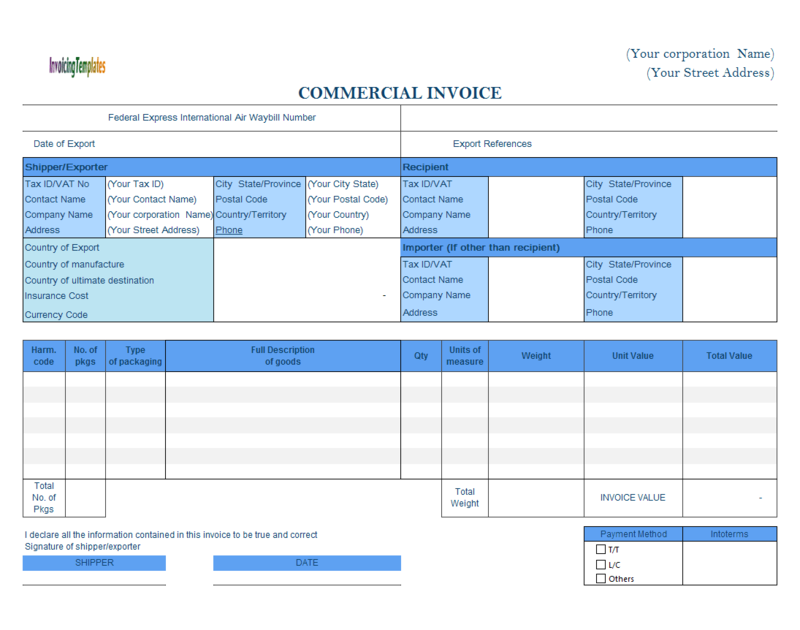 Please feel free to try the Invoice Manager for Excel (namely Uniform Invoice Software) version too, which is also provided here on InvoicingTemplate.com. 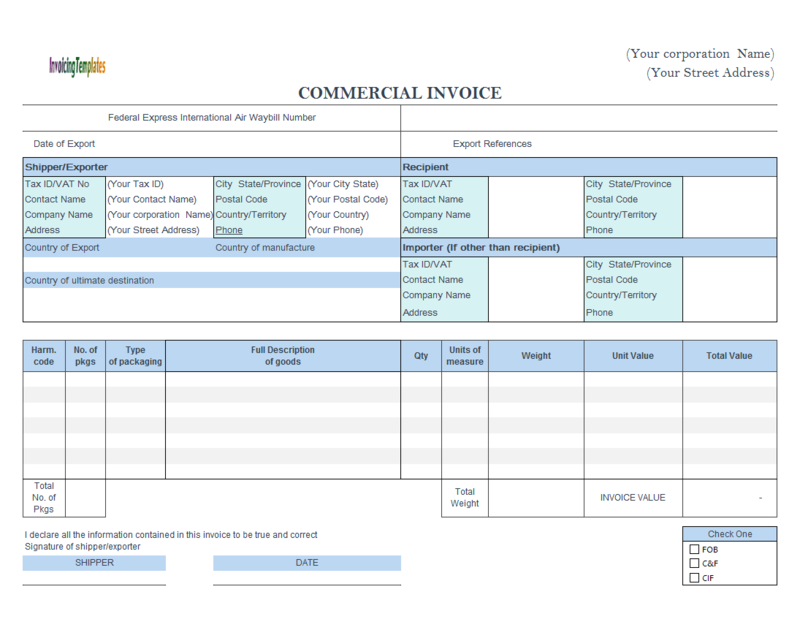 On the top of the invoice, there are fields for you to detail your company or business information, such as your name / company name, address, phone, fax, email, web, and you can also add your US Federal Tax Payer ID (Business Number in Canada) if applicable. 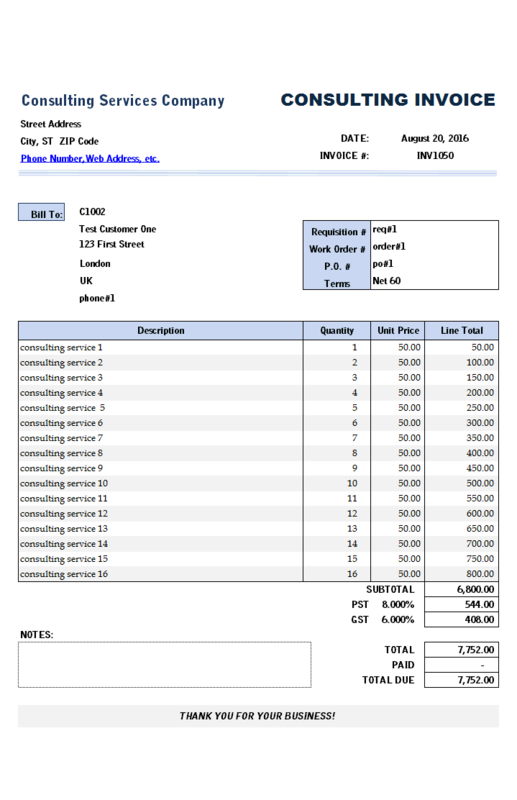 Since this is a service invoice, there is no space for you to enter shipping information. 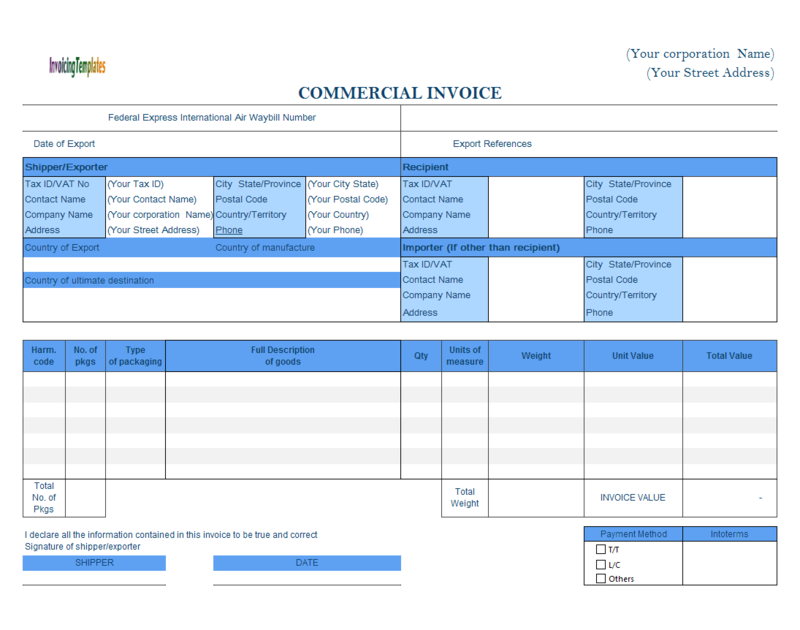 A few new fields added to the right of the client section are Requisition #, Machine #, Work Order #, P.O. # and Terms. If you don't need one or all of them, simply move them out of the print area. To do this, drag your mouse to select the cell or cells you don't need, and then push your mouse key on the border of the selected area and then drag it out side the print area. 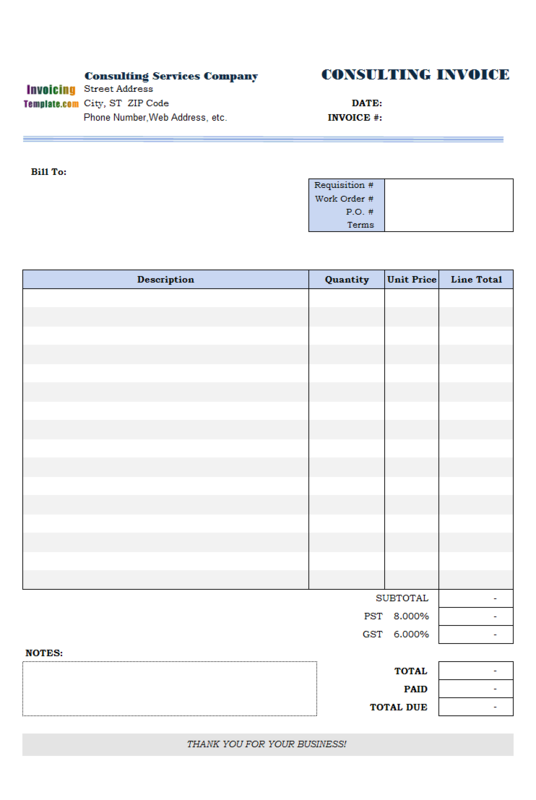 Like other form designs here on InvoicingTemplate.com, Consulting Billing Template is free (offered to you at a price of 0.00USD). It works on Windows XP and all newer versions of Windows, and Excel 2007, 2010, 2013 or 2016. The top bar is now filled with gradient color. Font types and sizes fined tuned. 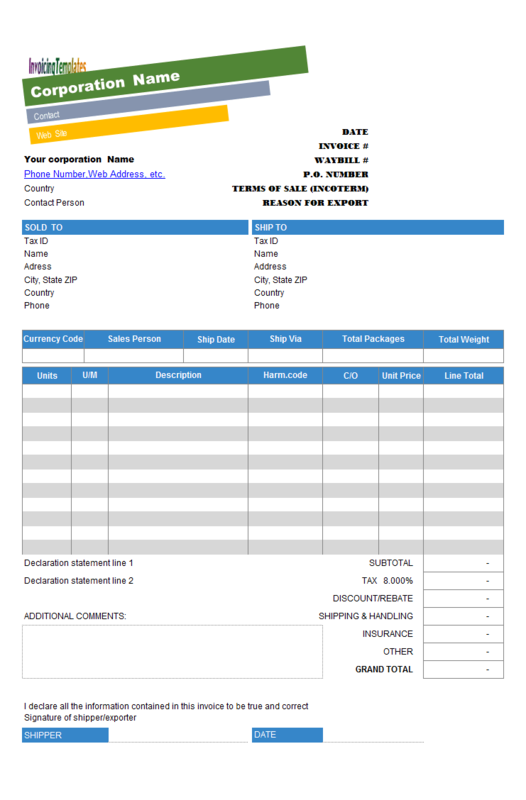 Updated the "Product Report" for c4008 - consulting-template.xlsx.